Today we stopped gallivanting and returned to the familiar slopes of Leysin. We have been enjoying the riding so much that we haven't taken many photos or videos. 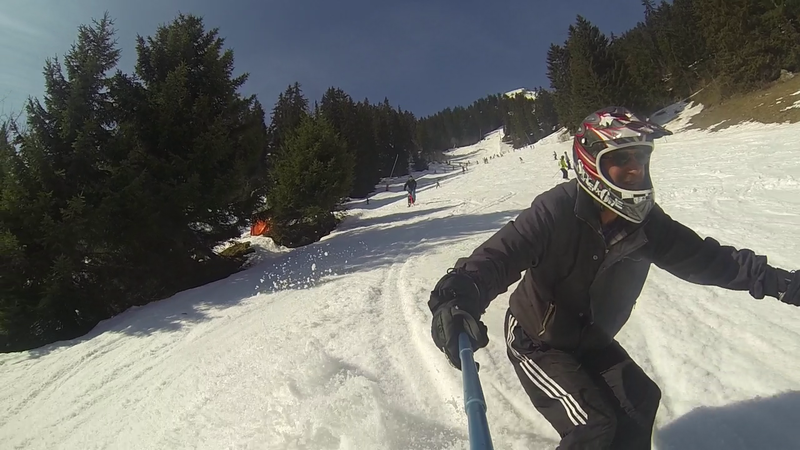 Today we set about redressing the imbalance and I donned SnowBlades to act as camera mule for Carl's GoPro set up. We started early so that I would be able to ski in something still vaguely resembling snow, yet not too hard for Carl to find an edge. Even by 11 o'clock in the morning it was proving to be a challenge on some South facing runs. I had to adopt what could be best described as a water skier stance; riding down the fall line on just the tails of the tiny 85cm skis to avoid the tips sinking into the mire. We got some great footage, which will hopefully be released over the next couple of months to entertain you during the dry season. Leysin might be quite a small resort, but it is perfectly formed. The runs, though limited, are a joy to ride, even in such late season conditions. Earlier in the year there were so many pockets and hollows to explore off-piste and all easily accessible from a chair-lift. There is a rail link from the resort to Geneva airport and the cost of transfer very reasonable compared to the usual shuttle prices. Accommodation can be found for French prices and the same can be said for the lift pass, we even found a couple of simple eateries that were close to UK prices. However if you have an unquenchable thirst for fine wines and grandiose dining, then yes, Switzerland will eat a big hole in your savings. Tomorrow Carl and I will head back towards Geneva, possibly taking in one of the ski stations of the Jura mountains en route.